PONANT has announced the arrival of its new vessel, Le Lapérouse, the first of six new ships in the cruise line’s PONANT EXPLORERS series. Le Lapérouse left the shipyard in Norway on 16JUN and reached Reykjavik on 19JUN for the start of her maiden voyage around Iceland. The ship’s inauguration will take place on 10JUL in Reykjavik. “Le Lapérouse is a wonderful achievement for the company and the result of intensive teamwork with Vard and Fincantieri. From remarkable nautical performances to technical excellence and offering an extraordinary level of comfort, everything is in place for the PONANT EXPLORERS series to be a huge success” said Jean Emmanuel Sauvée, CEO and co-founder of PONANT. With a smaller capacity of 92 staterooms and suites, all with a balcony or private terrace, the ship features an elegant design, a long sleek line, state-of-the-art technology, and a variety of innovations, including the "Blue Eye," a multi-sensory underwater lounge designed to allow guests to experience the underwater world via two portholes in the form of a cetaceous eye looking out on to the sea bed. The lounge - which will be on all six PONANT EXPLORERS - will also features Body Listening sofas, offering a sensorial listening experience by corporal resonance. Le Champlain (2018) Le Bougainville (2019) will be the next yachts to launch. 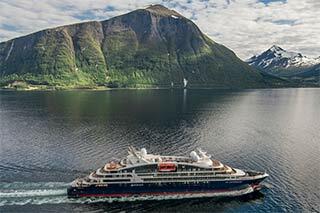 Le Lapérouse and Le Champlain, embarking on their maiden voyages in June & October 2018, will navigate Northern Europe, Iceland, the Mediterranean, South America, the Maldives, Sri Lanka, and the Caribbean. Le Bougainville and Le Dumont d’Urville will join the fleet in April & August 2019, with expedition cruises to Asia, Australia’s Kimberley & Great Barrier Reef, New Zealand, Cuba, Panama, Cape Verde, Bissago Island, the Great Lakes, the Seychelles, and more.